“Climate change is relevant and happening now. We need to stand up and make change. Young people are ahead of the curve. They are not sitting around debating whether climate change is real or not. They are not interested in engaging the sceptics they want to debate the solutions not the science. Young people are in a unique position as they face the reality of a changing climate: potentially they are best-placed to push for and define the long-term societal response to climate change, yet they’re also the most vulnerable to the legacy of decisions made by older generations. Although young adults arguably have the most to gain and the most to lose in a changing climate, their voices are not prominent, and engagement with climate change among this crucial demographic is in many ways limited. See climate change as problem for the here and now and will respond positively to messages that frame climate change as a contemporary concern that requires an immediate response. Are receptive to the idea of protecting the ‘things they love’ from climate change. However, the devil is in the detail – the things young people love and want to protect should not be assumed but instead identified through audience research. Want the climate jargon explained in plain language. Want to know what they can do. They want it clearly set out what needs to be done by who, when, where and what young people can do to make a difference – and which policy prescriptions support this. Are willing to pressure political leaders for more progressive climate change decisions but do not, as a rule, have much faith in politicians and other elite decision makers. Sometimes find it difficult to talk about climate change to their peers because of a perception that it comes with a certain stigma and is ‘uncool’, or preachy to do so. Initiatives to engage young people should take this into account, and consider how discussion of climate change can be ‘normalised’ among this demographic. Getting back to basics when we say climate change what are we talking about? 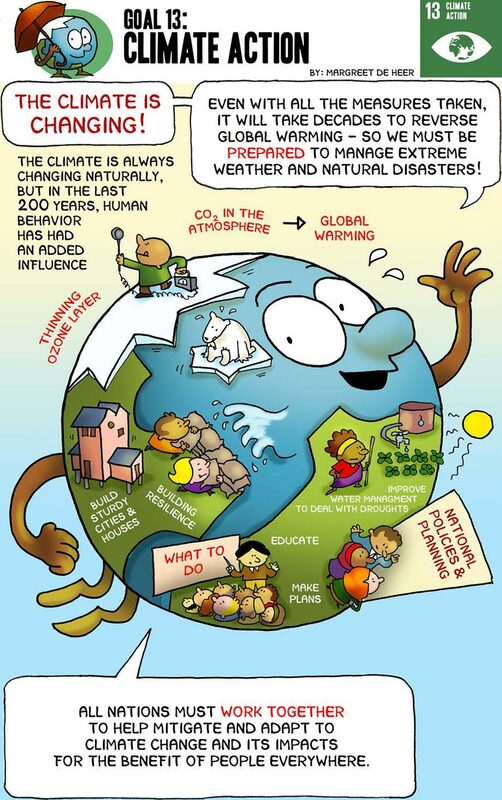 The term ‘Climate Change’ commonly refers to influences on climate resulting from human practices. This is known as anthropogenic climate change. Increases in the concentration of so-called greenhouse gases in the atmosphere resulting largely from burning of fossil fuels and deforestation, have led to an observed and projected warming of the earth, known as the enhanced greenhouse effect. volcanic and meteorite activity and plate tectonics (movement of the continents). For example, glacial cycles are driven by wobbles in the Earth’s orbit. Greenhouse gases and polar ice sheets respond to this wobble and enhance the warming/cooling cycle of the earth by 2-3°C. Other natural phenomena cause variability at decadal and inter-annual scales: changes in sea surface temperature, ocean currents and the associated changes in the atmospheric circulations (eg. the El Niño-Southern Oscillation). The resultant changes to the climate from these phenomena are considered to be natural variation. The study of the climate and its variations, extremes and shifts is not a new science; Svante Arrhenius suggested in 1896 that burning of fossil fuels might cause an increase in carbon dioxide in the atmosphere and in turn warm the Earth. However, the recent succession of unusually warm years and extreme climatic events has heightened awareness and climate change is now a mainstream media topic, in recent times moving to headline status. The intensity of interest is placing considerable pressure on the capacity of the scientific community to respond to the concerns being raised. Until very recently much of the media attention centred on the sceptics who put up counter arguments to the existence of climate change, pointing to the 5°C difference in global average temperatures between the glacial and inter-glacial periods (>10,000 year cycles) as evidence that recent temperature trends are within normal variation. These sceptics played a very important role in forcing the scientists to produce evidence of rigorous analysis of their scenarios and projections. If current trends continue, scientists predict temperature rises of up to 5°C over the next century, causing major perturbation of natural and human systems. The Earth would be much colder if not for the ‘greenhouse’ gases that provide a blanket that warms the atmosphere. Some of the gases in the atmosphere transmit the short-wave radiation from the Sun to the Earth, warming its surface. Some of this warmth is emitted in the form of long-wave (infrared) radiation from the Earth to the atmosphere and some of the gases in the atmosphere absorb and re-emit radiation of this wavelength, effectively enhancing the warming of the lower atmosphere. These gases are called greenhouse gases because their effect is similar to the function of a glass greenhouse that heats up as infrared radiation is trapped by the glass. The main greenhouse gases are water vapour, carbon dioxide, methane and nitrous oxide, all of which occur naturally in the atmosphere. Water vapour is the major contributor to the greenhouse effect. Water vapour concentrations fluctuate regionally due to natural impacts, and human activity generally does not directly affect water vapour concentrations except at very local scales. However, climate models are now predicting the concentration of water vapour in the upper troposphere may increase in response to increasing concentrations of other greenhouse gases. This increase in water vapour could play a key role in amplifying the rate at which the climate warms. The gases that contribute directly to the enhanced greenhouse effect because of anthropogenic activities are carbon dioxide, methane and nitrous oxide emitted from combustion of fossil fuels, deforestation and agriculture, and sulphur hexafluoride, perfluorocarbons and hydrofluorocarbons arising from industrial processes. It is these six gases that are controlled under the UN Framework Convention on Climate Change. Some other gases, including carbon monoxide, nitrogen oxides and volatile organic compounds, contribute indirectly to global warming through chemical reactions in the atmosphere. Other emissions, such as sulphate aerosols have a cooling or dimming effect on the climate as they reflect some of the short-wave radiation before it reaches the earth’s surface. The contribution of each of the greenhouse gases to global warming is dependent on its Global Warming Potential (GWP), expressed as carbon dioxide equivalent (CO2 e). and any indirect effects of the gas (eg. methane will produce ozone gas in the lower atmosphere and water vapour in the stratosphere). The GWP of nitrous oxide is 298 times that of carbon dioxide and methane is 25 times that of carbon dioxide when considered over 100 years. The concentration of CO2 in the atmosphere in 2005 was 379 parts per million (ppm), compared with the pre-industrial value of 280 ppm, and is rising at 1.9 ppm per year (1995-2005 average). The increase in concentration of greenhouse gases in the atmosphere has altered the earth's radiative balance, resulting in more of the sun's heat being absorbed and trapped inside the earth's atmosphere, producing global warming. Without mitigation measures, the concentration of CO2 in the atmosphere is predicted to rise to at least 650 ppm and up to 1200 ppm by 2100 (IPCC 2001a), which is expected to increase average global temperature by 1 to 6°C. Two degrees has been identified by scientists as the “tipping point” where abrupt regional climate shifts could occur due to global warming. In other words, that point where global warming is considered "dangerous". view video on BBC News HERE. In 2016 Northlakes High School students took on the challenge of the complex topic of Climate Change and created this magnificent book “Climate Change is a Shared Responsibility” so we could all understand the science and know how to take action. The 2015 United Nations Climate Change Conference, COP 21 was held in Paris, France, from 30 November to 12 December 2015. It was the 21st yearly session of the Conference of the Parties (COP) to the 1992 United Nations Framework Convention on Climate Change (UNFCCC). The conference negotiated the Paris Agreement, a global agreement on the reduction of climate change, the text of which represented a consensus of the representatives of the 196 parties attending it. In the 12-page document, the members agreed to reduce their carbon output "as soon as possible" and to do their best to keep global warming "to well below 2 degrees C". France's Foreign Minister, Laurent Fabius, said this "ambitious and balanced" plan was an "historic turning point" in the goal of reducing global warming. However, some others criticized the fact that significant sections are "promises" or aims and not firm commitments by the countries. For more information on Paris COP21 Summit visit here. Here is what Australia said they would do. Climate change adaptation and mitigation agricultural systems hold the key for the largest readily achievable contributions to both climate change mitigation and adaptation. Worldwide agriculture generates one third of man-made greenhouse gas emissions. This documentary created for Earth Hour in Australia in 2015 shines a light on the impacts of global warming on Australian food and farming. Incorporating first-hand stories from Australian farmers highlighting the impact global warming is having on their farms and the nation’s availability of fresh, home-grown food and quality natural fibres. Local Climate Champion Farmer and Farmer for Climate Action Lynne Strong talks about the impact of climate change on her family farm and how the family is managing the risk and reducing their footprint here. AYCC is a nation-wide coalition which has been uniting youth organisations and over 120,000 young people across Australia since 2007, with the goal of building a generation-wide movement to solve the climate crisis. The AYCC does this through the education, empowerment, inspiration and mobilisation of young people across the country, focusing on generating a groundswell of support and momentum to inspire the transition to a more sustainable, just and fair Australia. We believe that this will be achieved through both political impact and long-term cultural change. AYCC Wollongong is a local group with more than 100 passionate and active members. Read about the local arm of AYCC here. This tool has been designed for Australian natural resource managers and practitioners to help inform revegetation programs in the face of climate change. You can use the guide to see how under different scenarios your region will change over time. Students can use the guide to see how different species will be affected in the landscape and begin to think about how we might need to manage our natural systems to ensure their survival into the future. Note suitable for secondary school students.